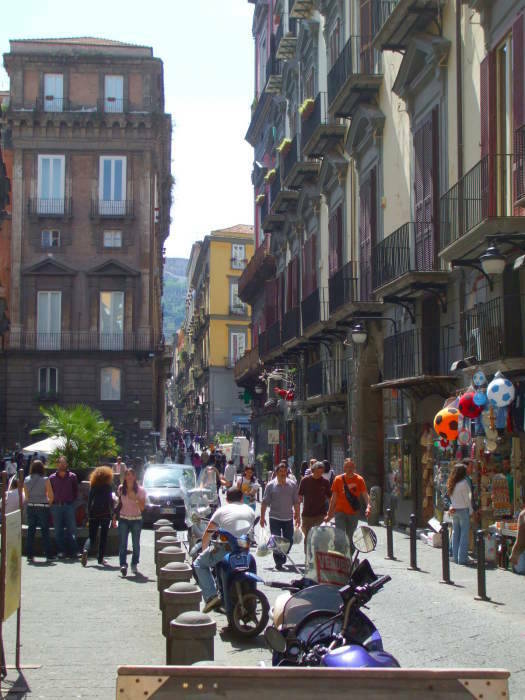 Napoli is the real name of the city, but English speakers spell it Naples. 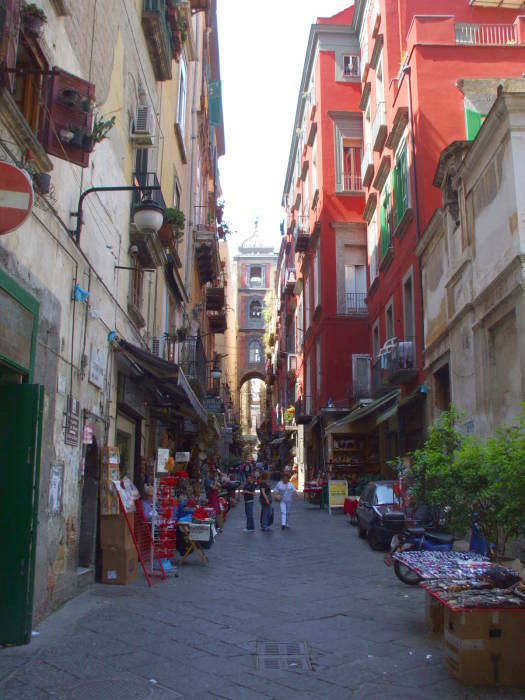 Napoli is an old city, founded than 2800 years ago as a Greek colony first called Παρθενοπε or Parthenope and later Νεαπολις or Neapolis, the origin of its eventual name Napoli. 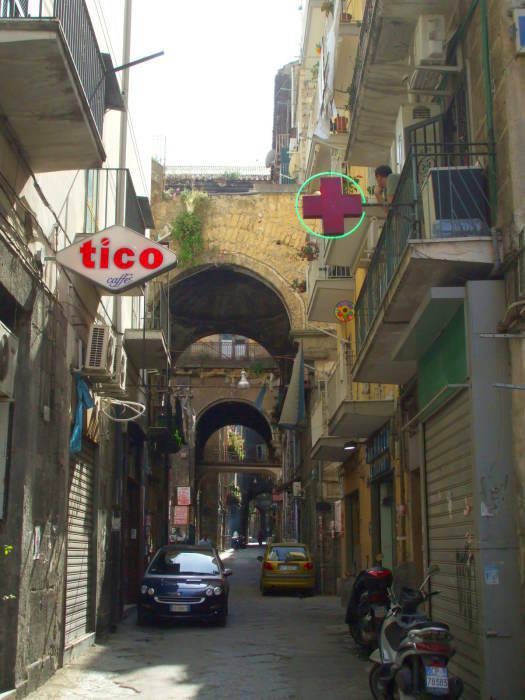 Its Centro Storico or Historic Center isn't that old, but it is old and still going strong! 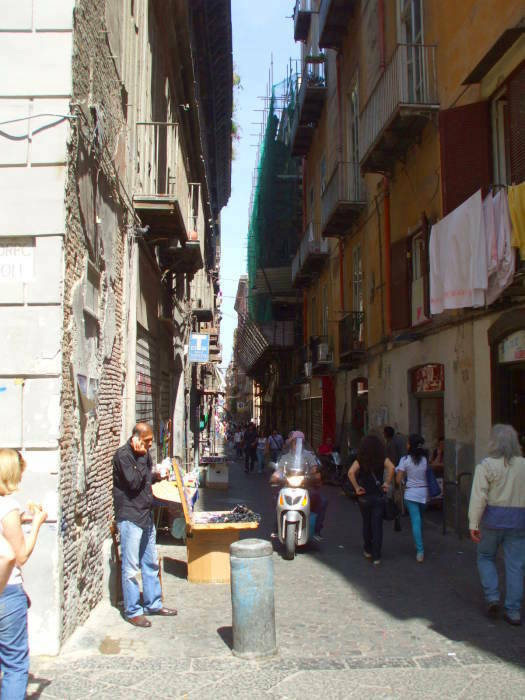 Most of the pictures on this page were taken over a couple of days of wandering the narrow streets in the oldest parts of Napoli. Neapolis was part of Magna Graecia, "Greater Greece", or the overseas Greek colonies. There were several Greek colonies in the southern half of the Italian peninsula. Greek settlers colonized southern Italy and Sicily in the 8th Century BC. Their colonies were absorbed into the Roman Republic after the Pyrrhic War (280-275 BC). However, a small population in the "heel" of Italy still speaks Griko, a language combining ancient Doric, Byzantine Greek, and Italian. 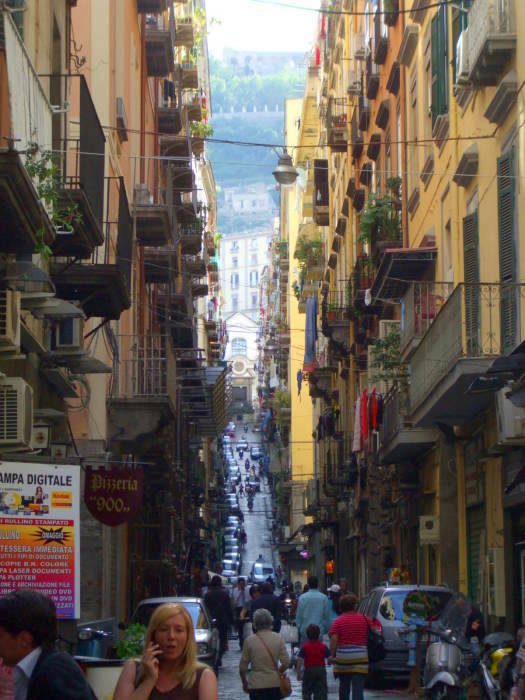 Napoli was in the central province of the Roman Empire for as long as that Empire lasted. The Roman Empire fell apart and the Italian peninsula became a complicated quilt of independent kingdoms, duchies, independent city-states, Papal States, and possessions of overseas powers. 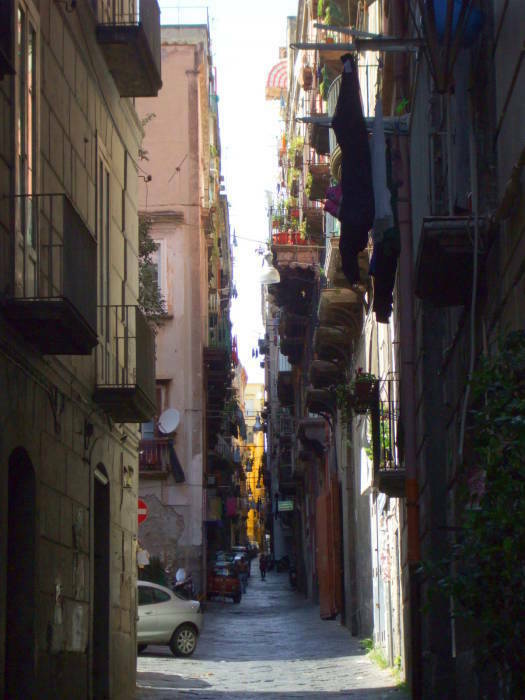 The Kingdom of Sicily eventually controlled most of the southern part of Italy, including Naples. 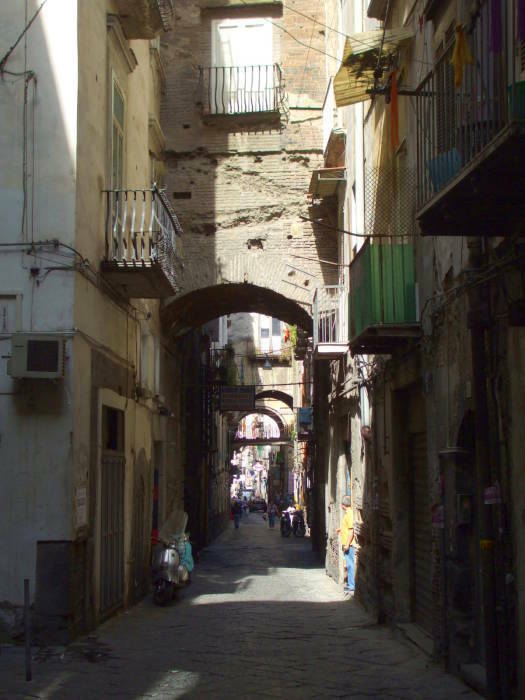 It broke up in 1282, splitting into the continuing kingdom, based on the island of Sicily, and the peninsular land. 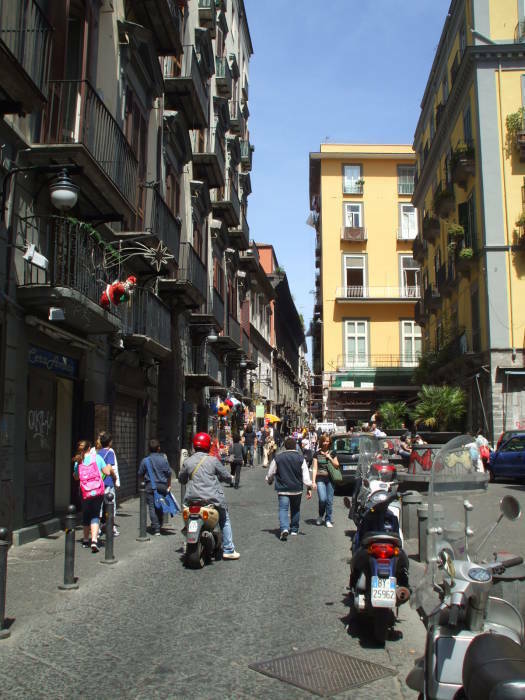 Napoli became the capital city of the Kingdom of Naples, now an independent kingdom covering the southern half of the Italian peninsula. 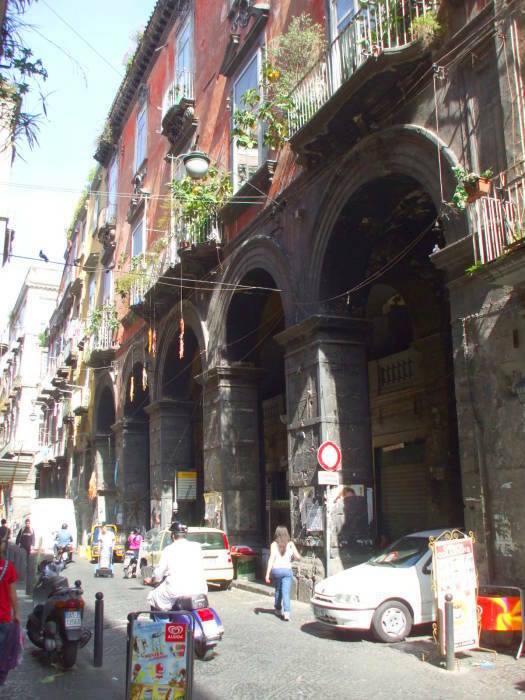 The Kingdom of Naples lasted from 1282 until 1816, which it again merged with the Kingdom of Sicily and the combination was called the Kingdom of the Two Sicilies. It was by far the largest, and also the richest and most powerful of the many Italian states in the century before il Risorgimento, or Italian unification in 1870. 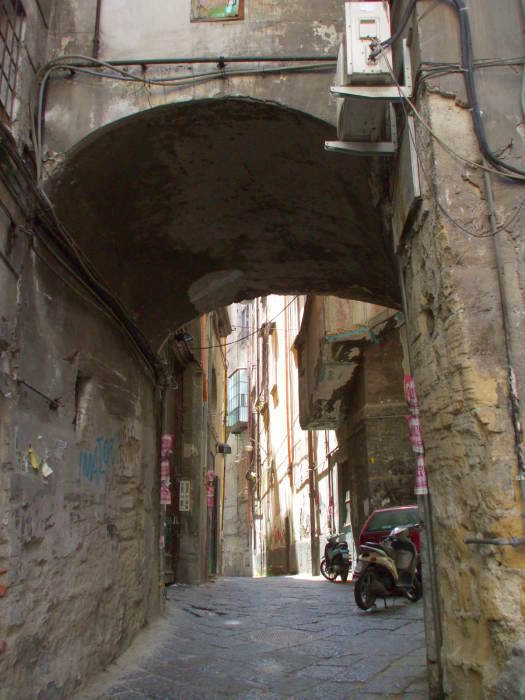 Napoli is the birthplace of pizza. Below you see a sign for a pizzeria. 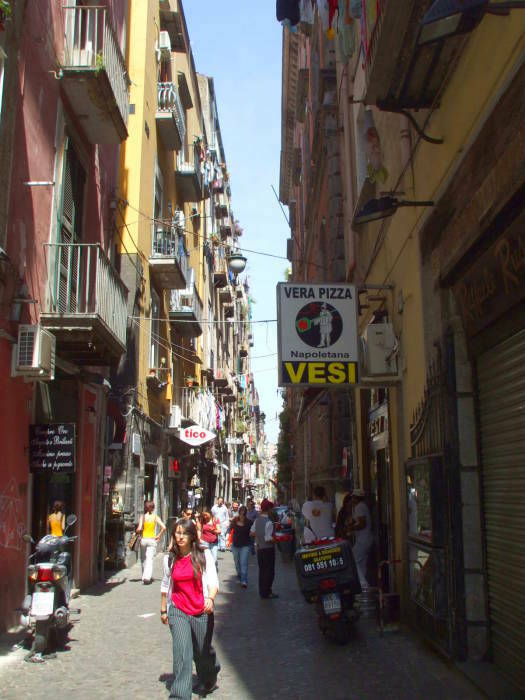 Places in the Centro Storico sell pizza by the slice, so you can sample different versions and compare. 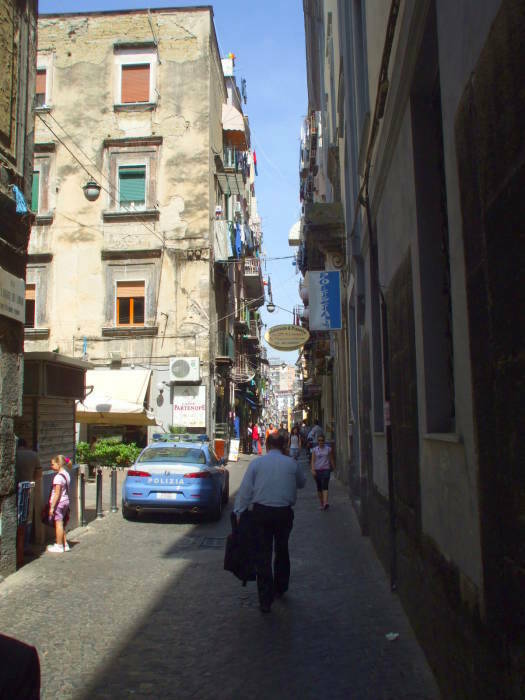 Napoli is one of the oldest continuously inhabited cities in the world. The Phlegraean Fields around the city have been inhabited since the Neolithic period. Greek settlements were established in the area by sailors from Rhodes during the second millennium BC, during the Bronze Age. The colony of Παρθενόπη or Parthenope was established on an island around the ninth century BC, and then refounded on shore as Νεαπολις or Neapolis in the sixth century BC. It has had its problems over the centuries. There were twelve epidemics of cholera and typhoid fever during the period 1834-1884. Then the 1884 cholera epidemic, mostly caused by the poor sewerage infrastructure, was even worse. Attempts to build industry and improve the infrastructure through the late 19th century and early 20th century were stifled by corruption. 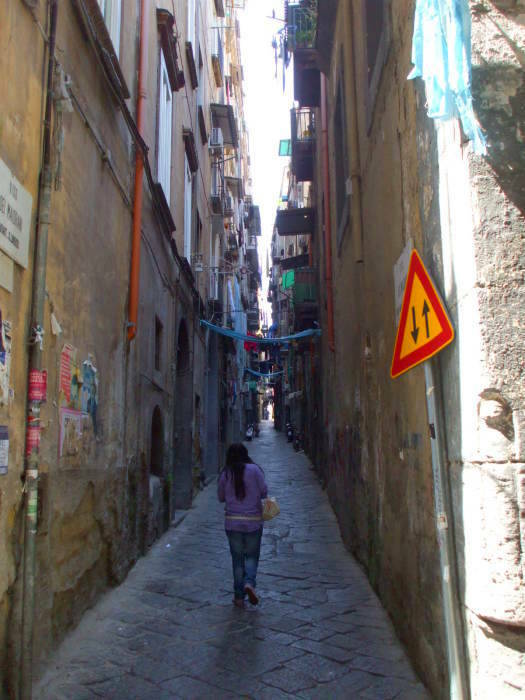 Napoli was the most-bombed Italian city during World War II. It was completely freed by the first of October 1943, when British and U.S. forces entered the city. Political and economic corruption have remained pervasive, and unemployment is high. 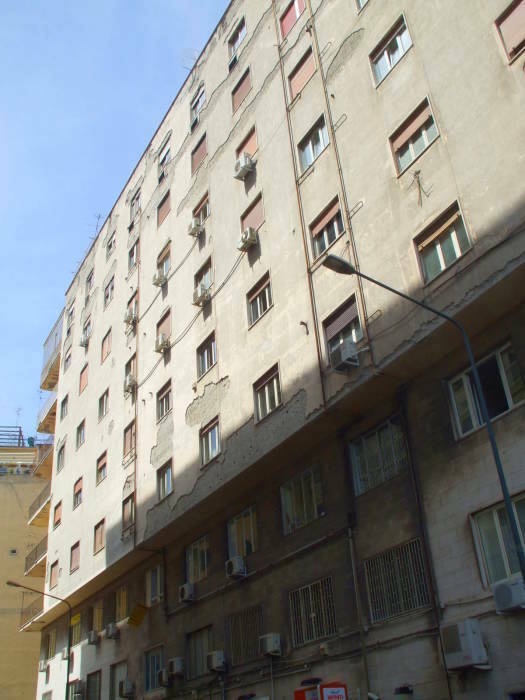 National media report that the continuing waste disposal problems are caused by the involvement of the Camorra organized crime network. 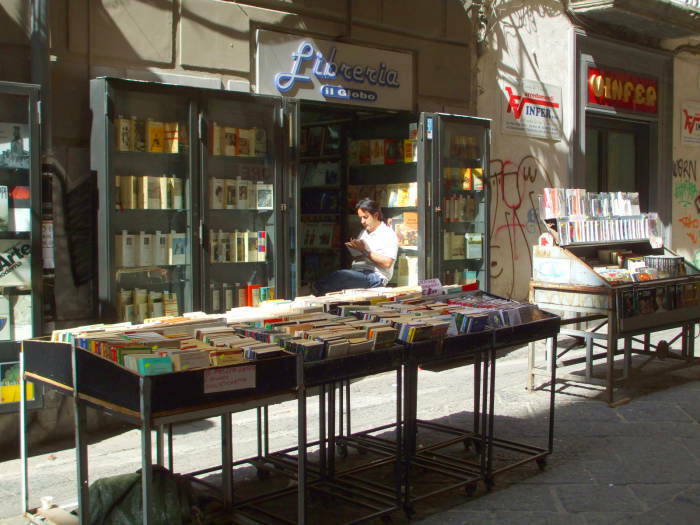 Books, fruit and vegetables, everything is for sale. Many buildings have large and heavy doors opening into open courtyards. 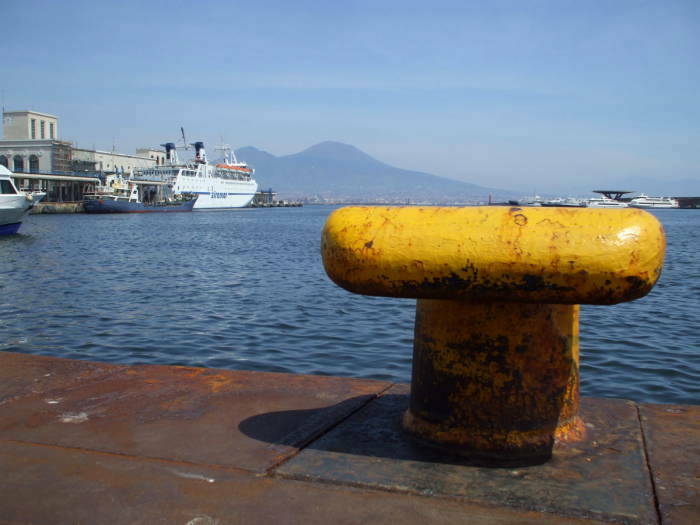 Naples has always been an important seaport, and many ferries still call there daily. Small fast ferries go to Capri and other islands, Sorrento, and the Amalfitani Coast. Large ferries make overnight trips to Sicily, Sardinia, Corsica, and Tunisia. Yes, that is Mount Vesuvius you can see across the bay. 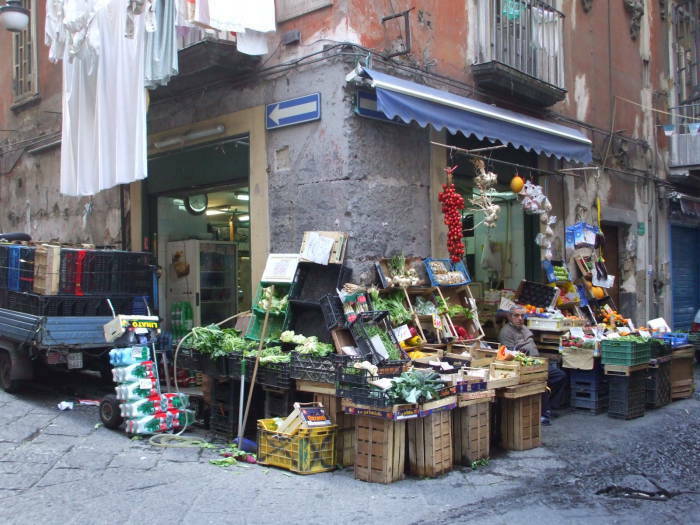 Visit Pompeii, Herculaneum, and Oplontis (at Torre Annunziata) while you are in Naples! 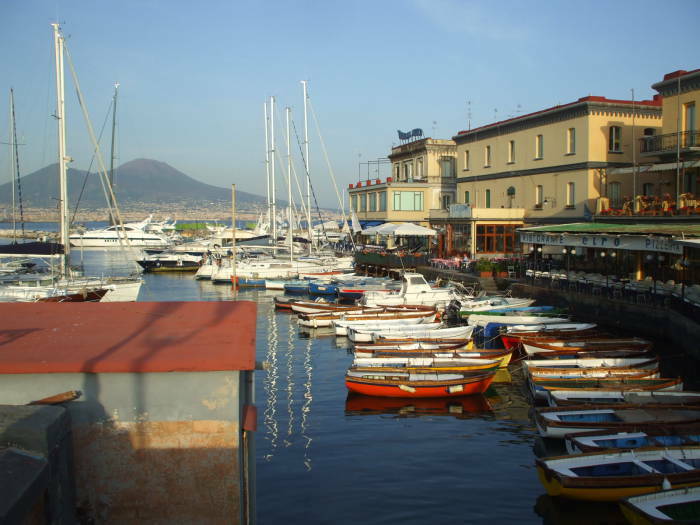 The Circumvesuviana train lets you easily visit the various sites buried by Vesuvius back in 79 AD. I have pictures and descriptions of Pompeii and Oplontis, click on their names to see the pictures. 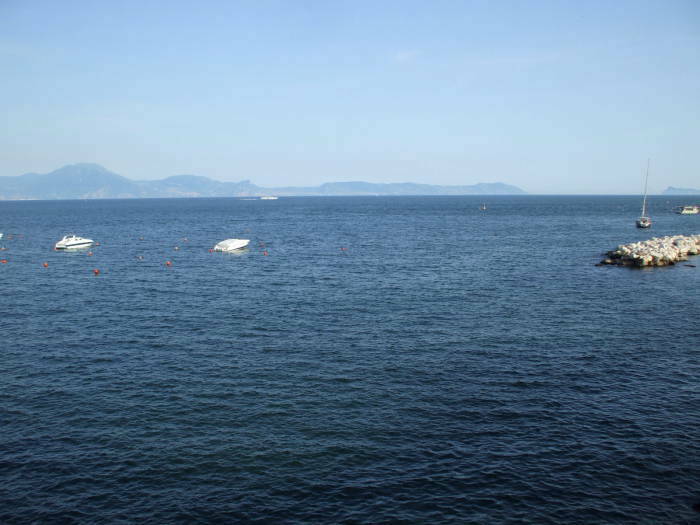 The Peninsola Sorrentina and Isola di Capri are further away but still visible from the harbor. 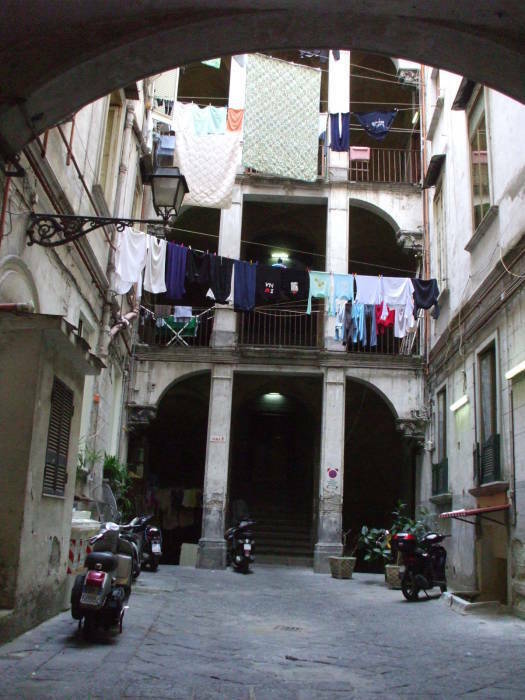 I stayed at the Hostel of the Sun while I was in Naples, it's a great place to stay! It's down by the harbor and easy to reach on the Alibus shuttle from the airport. 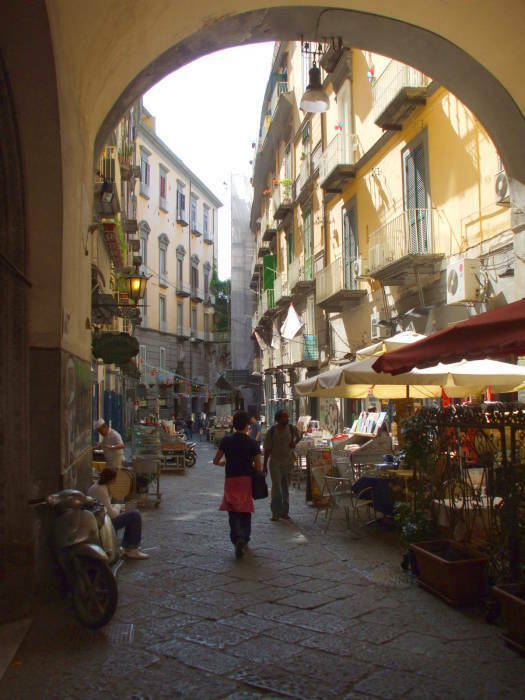 Take the bus to Piazza Municipale, next to Stazione Marittima, and walk two short blocks north along the waterfront Via Cristofo Colombo. 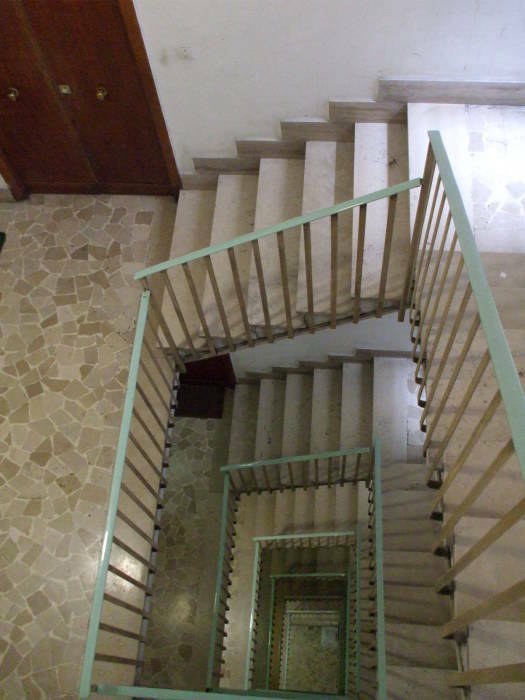 It's a long climb up the stairs to their 7th floor location, so take the lift! 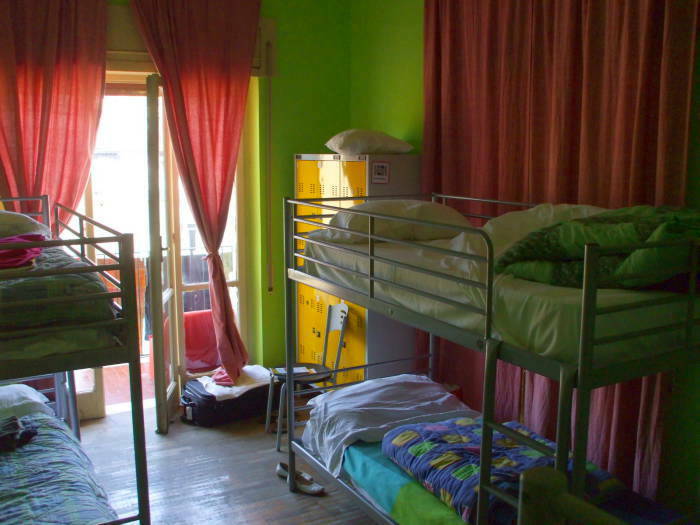 They have nice clean rooms, a great location, a good breakfast, and a very kind and helpful staff.